The team, including MAG staffer Joel Braxton, and MAG pilot apprentice Jason Maust, then headed south to continue clearing jungle and doing initial excavation on our new airstrip in Gabon’s most populous department, Estuaire. This is part of a new “Social Works Campus” project being spearheaded by the Christian & Missionary Alliance National Church of Gabon. The new campus is known as “PK-27”, is east of the capital city of Libreville and is named for its location, 27 kilometers down the national highway from where it begins at the ocean. Aided by some rented heavy equipment, the guys were successful in completing Phase II of the airstrip construction, which included completely clearing the landing area and preparing for the next phase of leveling, grading, and drainage. Future phases, dependent upon funding and volunteers, will complete the airstrip surface, build a hangar, an aircraft maintenance facility, and an operations office that will support flight and aeromedical services for the PK- 27 base and hospital. This is an important and far-reaching project slated to include an orphanage, school, widow care ministry, a small farm, vocational and ministry training centers and a fully equipped medical clinic and hospital –all supported by an airstrip and flight program run by MAG. This base will not only anchor an aeromedical network between PK-27 in the north and Bongolo Hospital in the south, but will allow more ready access for medical and ministry teams to reach the entire country. Steve Straw, who pioneered the aviation program in Gabon when previously serving there as a missionary, shared one of the trips most impactful moments when an old friend arrived on the work site. Her name is Henricka. While in Gabon, the team also ventured further south to the MAG base at Bongolo Hospital with the mission of reconnecting with our hospital ministry partners while doing some needed maintenance on our airstrip and aircraft hangar. The trip was successful, with the dangerous 16 hour round-trip drive serving as a relevant reminder about the need for aviation there. 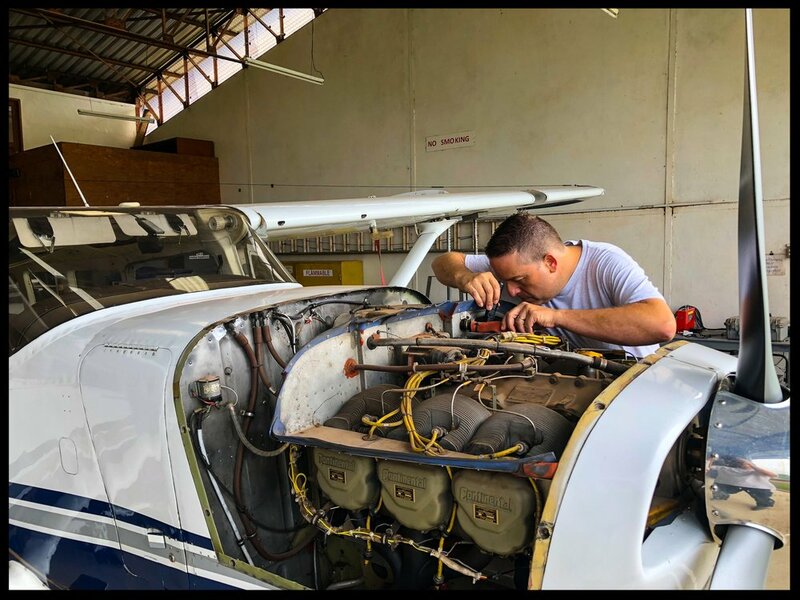 And, even though MAG is temporarily without full-time pilots in Gabon, continuing to maintain both infrastructure and ministry relationships is critical as our Cessna 207 is still the only missionary air ambulance serving a country of nearly 2 million people. Bongolo hospital and its missionary and national staff see over 40,000 patients per year from all over Africa and this aircraft is a needed life line for medical staff, patients, and visiting teams. Please pray for the teams, trips, and resources still needed for MAG to get airstrips open, aircraft back to work, and new missionary staff in place so that “Help and Hope by Air” continues to flow out to Central Africa – ensuring a brighter future for people like Henricka! Short video of our MAG team on the ground in Cameroon and Gabon.